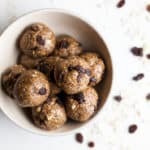 Add rolled oats, ground flax seed, chia seeds, cinnamon, nutmeg, maple syrup, almond butter, vanilla extract, and vanilla protein powder to food processor. Add mixture to a large bowl, add in raisins. Stir to combine.